I've seen lots of things bandied around about "Revamply", some of which I think is a bit misleading, so here's my honest take on the tool, having had the opportunity to test it before it was released. Caveat: I've tested it for less than 2 days, but everything I say is based on my actual honest opinion having tried it for myself, which doesn't of course make me an expert! So What Exactly Is "Revamply"? (WordPress, HTML, ClickFunnels, Igloo or any other Page Builder - free or paid)"
I’ve tested "Revamply" with my favorite theme (Dynamic / Genesis combination) and also my favorite page builder, Beaver Builder, and it worked well - BUT I couldn’t seem to change the Font Awesome Icons inserted originally via Beaver Builder, or their color. CSS Hero and MicroThemer (paid), and Site Origin CSS (free) allow you to make changes to the CSS, live on the actual website, but the big difference is they don’t bring websites in so you can play around. Once changes are made you’re pretty much stuck with them. Changing the font for example on a paragraph within "Revamply" will only change that particular paragraph. Generally, other CSS editors will change all instances of paragraph, or H3 heading for example. Sometimes this is a good thing, sometimes not. You can make sweeping changes, but sometimes you actually only want to change that particular instance. "Ever wanted to signup clients for your web services?" Previously you might have pitched a prospect without much to show them except a few examples from your portfolio. But how much stronger would it be to show them their own website with modern styling? With "Revamply" you can add a prospects website and make changes to the replicated copy within the system. You can then send the website owner a preview and offer to make the changes live on their actual website in exchange for say $1500. If they like the changes and say 'YES' then you can make the changes live on their website within a couple of clicks (after you've added the Revamply code to their actual website). This is a really awesome opportunity to show clients what a video would look like on their website for example, or just changing out those gaudy 70s style colors. Bear in mind that you will always need to have access to the clients website to add the code before the changes can be made live. If the client doesn’t pay, or you’re charging something monthly and the client stops paying, it’s easy to turn the changes off and revert it back to what they had previously, putting you in control. The Upgrade Pro option gives you the option to download the pages you edit and create so there seems to be a bit more longevity and stability, but at this stage I’m not 100% sure of how that would work with WordPress sites. "Drag & Drop ANY element on your website and customize past and present websites in minutes"
Clicking on some of the elements opens up various options like different styles of buttons and countdown timers to choose from so you have more choice than you might have first thought. Bear in mind dragging an element on to a page doesn’t automatically mean existing elements move around automatically to make room for it. You do need to re-arrange things manually and possibly drag and resize sections of the website for things to look right. "Split test at WILL! You can use our softwares A/B Split testing functionality to test as many variations of your websites as you want. " Even if you haven't gotten into split testing as such, this is a very cool function! Imagine being able to make different variations to see what works best or what variation your client or prospect prefers if you're trying to get a new client on board! to make changes to but can't because it's html? " No need to open up a HTML editor (bliss!) and try to mess around with the page - easy in theory, not so easy in practice! 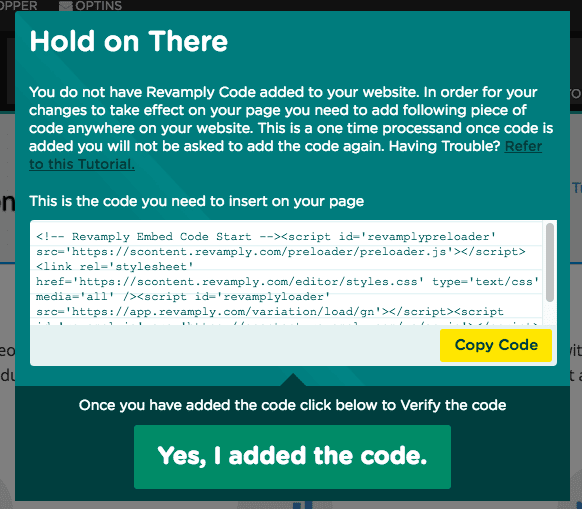 "Revamply" definitely makes editing HTML much easier when I tested it - huge benefit if you have PLR templates and things gathering dust on your hard drive. "Can It Do Animations? " Yes, with Revamply you can edit the current static parts of your website and animate them. There's a huge suite of animations available from fades to rotations, slides and more. enough that no one is impeding on 'Copyright" laws. How to insert the Code in your WordPress website? You can do it manually by adding the code to the header.php or footer.php file, but bear in mind if you do that and your theme has an update, the script will be overwritten by the update. The easiest way to do is to use a plugin like "Header and Footer Scripts Inserter" by Arthur Gareginyan (available for free on the WordPress repository).